Saturday morning, there was no hurry and no need to alter the usual weekend-morning routine. I wasn't getting picked up until 9am and I'd organised everything the night before, so I just cruised through breakfast with a cup of tea and some chocolate buckwheat granola (OMG YOU HAVE TO MAKE THIS IT IS AWESOME) with sliced banana and soy milk. I made a PB sandwich with half a gluten free turkish pide and packed a banana for lunch, along with my jandals, a change of clothes and a towel for afterwards just in case. You never know what's going to happen on a trail run! 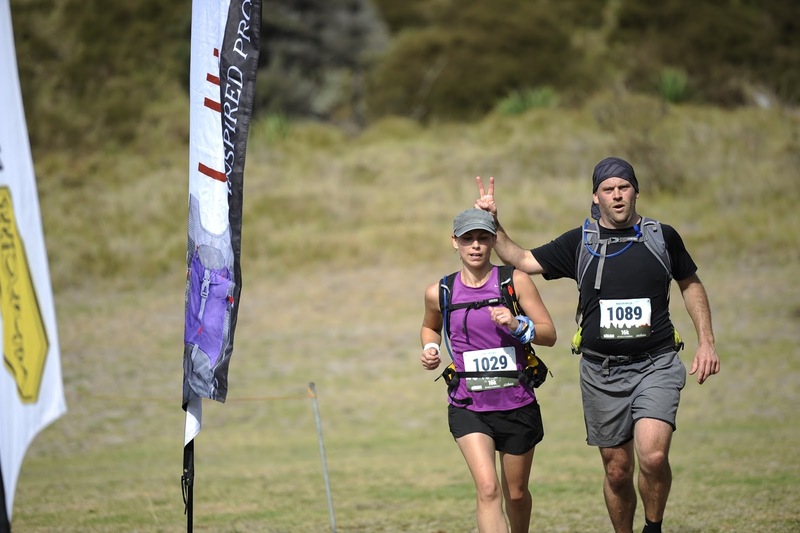 I double-checked I had everything I needed in my trail pack, and patiently waited for my friend to swing by and grab me on the way to Muriwai. He was only ten minutes late (he's always late) and we enjoyed a relatively leisurely drive out to the west coast, yakking away about anything and everything. So the bus ended up being an hour late. Nobody was particularly concerned or annoyed - this was the first ever official Hillary event so there was bound to be the occasional hiccup, and they had allowed so much time to transport us from the finish to the start that we'd still have time to spare at the other end when we finally arrived. The cute little wife from before got onto the bus for final 'before' photos of her husband, then stood outside teary-eyed, waving goodbye to him as we drove off. So sweet! After an hour-long drive, we did indeed arrive with time to spare. I picked up my official 'The Hillary' Thir that had been omitted from my race pack and wrapped it around my wrist, then we stood around listening to the race briefing and were told there was a slight change of plans to the start as the Council had declared that only five people at a time could cross the wooden bridge over the stream that runs into Bethells Beach. Collectively we all trudged up the road to the aid station and were able to cheer on some of the 80km and 34km runners who were making their way through, while awaiting our turn to walk through the mandatory shoe-wash station (to prevent the spread of kauri dieback disease) and cross the bridge. I had a quick catch-up and hello with Vera of Super Generic Girl fame, then after a few more longer-distance runners whizzed through we were off. It was a pretty slow start, not only because we started straight off with a hill, but because the trail for said hill was relatively narrow and there were 117 of us trying to make our way up all at the same time. Fairly soon we managed to spread out a bit and my friends and I got a bit of a rhythm going. The first few kilometres kinda whirred past pretty quickly, and before we knew it, we'd already covered a third of the race! We were fast approaching the 'stairs of doom'. I've mentioned these before - evil, evil stairs. They'd planned things well though, with an aid station at the top. A welcome sight after the energy-draining ascent, before heading off onto Constable Road. They had bananas, watermelon, gummy lollies, water, coca-cola and electrolyte drink. I downed some electrolyte and headed off, leaving Martin behind chatting with a friend. Constable Road was a pretty boring part of the run, but it was relatively short. I looked back a couple of times to see where Martin was, found he was still within view, and just kept going, knowing he would likely catch up on the down-hills. Getting back to the trails again was a happy eventuality, especially with the knowledge that there was less than 3km to go! 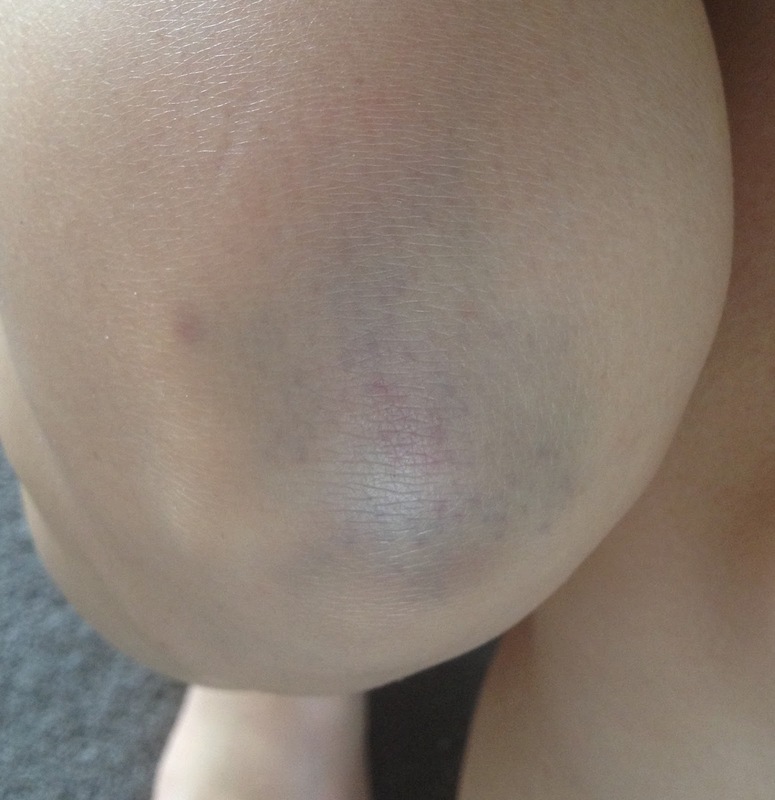 I mentioned before I love flying down the hills, right? That's pretty much what I did. I think my feet touched the ground, but oh, it was so much fun!!! I felt light as air and had an absolute ball of a time, even managing to spot the low-lying branch in plenty of time to duck under it before taking myself out. I briefly wondered if anybody had accidentally clothes-lined themselves, before forgetting all about it and just enjoying the moment. 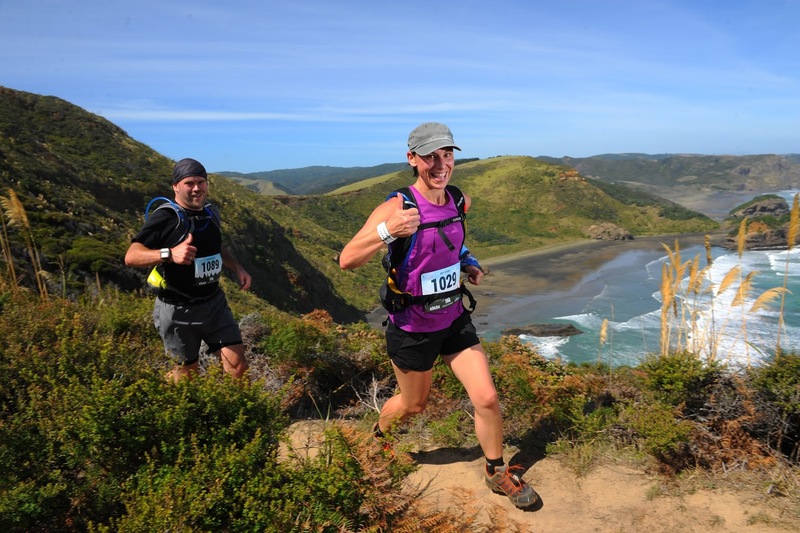 By the time I got through that section of trail and was nearing Muriwai Beach, Martin caught up with me and we ran the last 1.5km together. 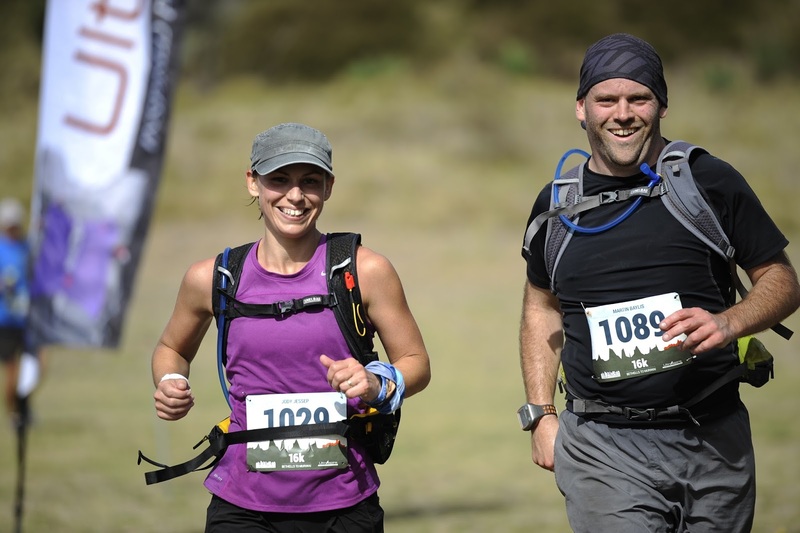 There was some packed sand (ugh), some soft sand (double ugh), and a wee uphill before running around the tents at base camp to the finish line. We saw the little wife from earlier in the day and gave a happy wave to her - she was still waiting for her husband to finish. He wasn't too far behind us. We finished in 2:23:17 (managed to squeeze into the front half of the finishers list) and were happy to grab a complimentary burger for second-lunch (mine was sans burger patty) along with some potato salad and an apricot slice. Yum! The first few 80km runners had arrived well before we did and we got to see some more arrive, along with plenty of 34km and 16km runners including that amazing little 11 year old - she got a huge hug from her dad as soon as she crossed the line, he must've been so proud! We sat in the shade and cheered on our friends who all came in at around 2 hours 30 minutes, and enjoyed some relaxing post-race atmosphere before finally deciding to head home to much-needed showers. I was impressed with the way the event had been run - despite the hour-late bus - and really hope that it becomes an annual event. 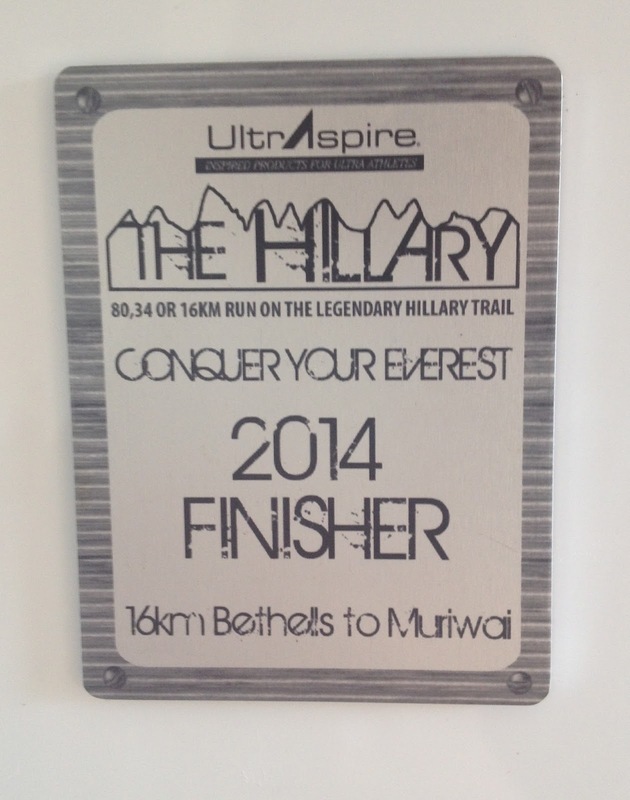 Perhaps the 34km next year... Hooray, The Hillary!! I hope it becomes an annual event too, cos I'm annoyed to miss it this year, and that is a fridge magnet I would like to have! Thanks :) If it goes ahead next year, you definitely have to do it! So much fun!! And the magnet medal is a brilliant idea, yes? I hope you had a really good time at the wedding this weekend! Girlfriend you look amazing!! Fit, fast and totally awesome! Sounds like an awesome run and the pictures are great!